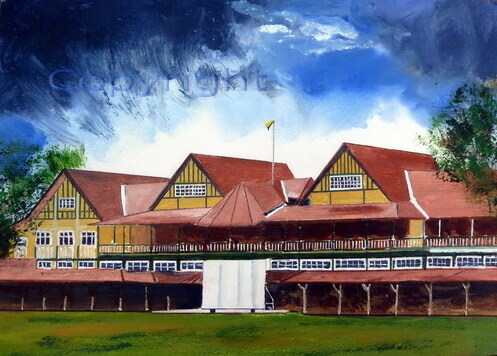 This painting was a non paying commission for the Bombay Gymkhana's in-house magazine. Those who know the area, which is quite a Mumbai landmark, will realize all those ugly new surrounding buildings are deleted. The red rooves against that stunning blue sky work so very well together. Who will be the proud owner of this lovely painting? I expect it will have a prominent position in the Gym. A very atmospheric painting. You have some lovely work in your portfolio Sunil! Super - C'est tres bon!!! The sky has really blown me away in this painting. The second one looks brighter though - i think it's the sky again... I see your time in the South of France has had much impact on you! Saw ur painting Bombay Gymkhana , Mumbai in monsoons,must tell u it looks very realistic. You have done a gr8 job at the main building keeping all the minute details in mind. Keep the good work going on......all the very best !! i liked the color of the sky, especially how it becomes white just above the Gym.